Currently the genomes of only 9 species of reptiles (among 10 000 species) are available to the scientific community. To change this a team at the University of Geneva (UNIGE), Swit- zerland, has produced a large database including, among others, the newly-sequenced genome of the corn snake, Pantherophis guttatus, a species increasingly used to understand the evolution of reptiles. Within the same laboratory, the researchers have discovered the exact mutation that causes albinism in that species. Suzanne Saenko collaborated with a Swedish team, to identify in the corn snake the mutation responsible for amelanism, a form of albinism due to a defect in the production of melanin (the black and brown pigments of the skin). 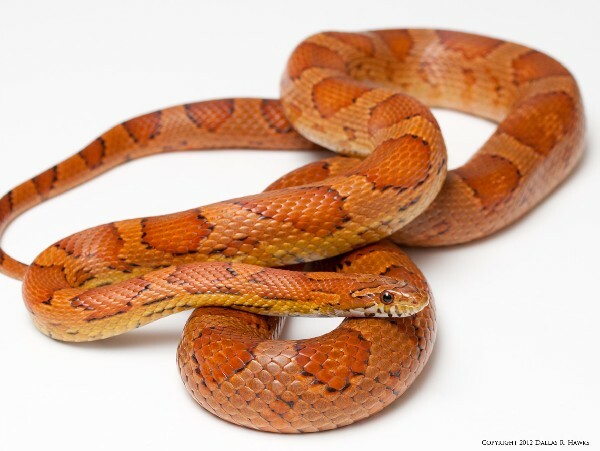 The skin of the wild type corn snake exhibits a light orange background colour covered with a pattern of dark orange dorsal saddles and lateral blotches that are out- lined with black, however, some individuals lack all signs of melanin in the skin and eyes. The Swiss team decided to search for the DNA mutation that determines that specific coloration. To this end, they bred wild-type corn snakes with amelanistic individuals and they sequenced each offspring born from that cross. Thanks to the newly-sequenced genome of the corn snake, the precise identification of other mutations responsible for multiple variations of snake skin coloration will be greatly facilitated.